This is not our first visit to Switzerland. My first was in 1970 when driving overland and Bev and I also spent time here in 1973 and again in 2005/6. For the sake of brevity I am not writing a day-to-day account of our visit. 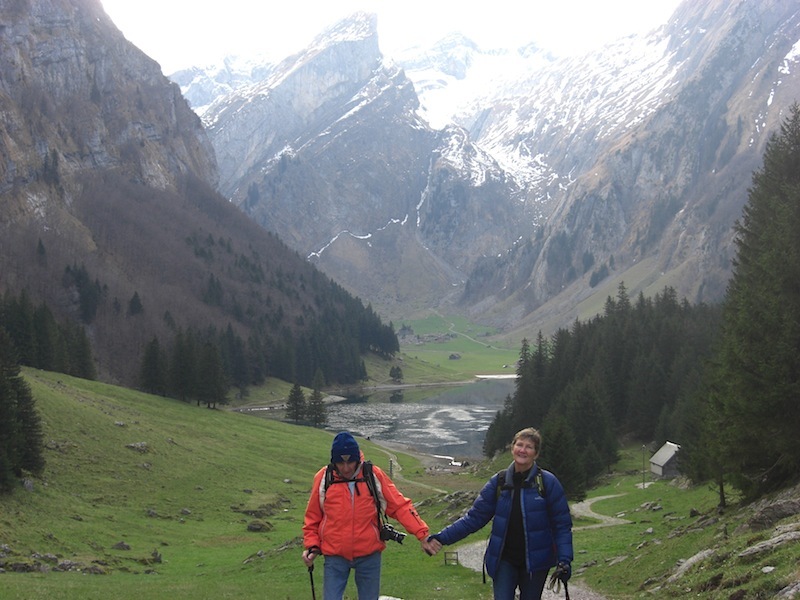 I am simply going to relate how we met our Swiss friends and the walks and trips they have taken us on since our arrival from Munich. By now you might be asking how is it that we know so many people around the world. The answer is simple: when we meet fellow travellers, be they bike riders, hitchhikers or backpackers we always ask where they are from. Inevitably the conversations lead to the exchange of addresses and the next thing you know is you have a lifelong friend. 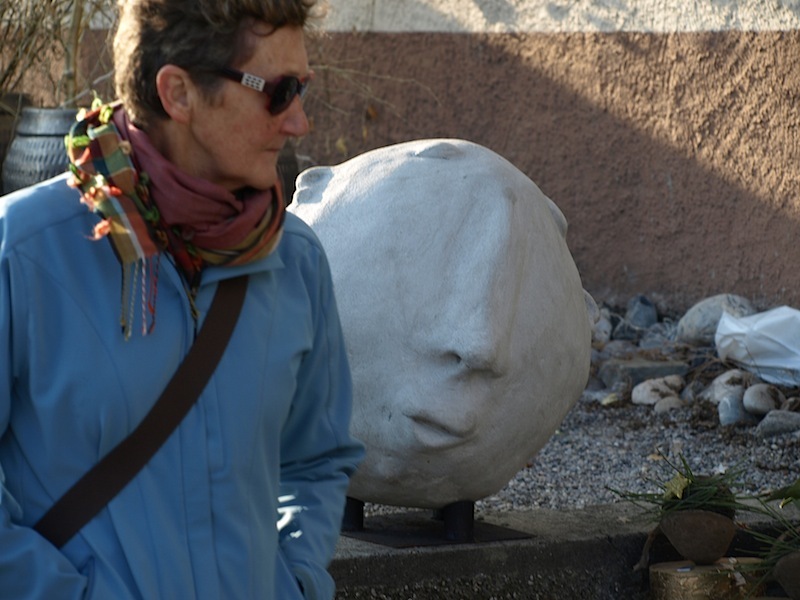 The people we are visiting in Switzerland are people we have picked up on the road or it’s because we have made our home open to them for various reasons. On this odyssey I have lost count of the number of times I have said to stranges ‘if you come to Australia, come and visit’. We met Thomas and Josef in 2001 in New Zealand. 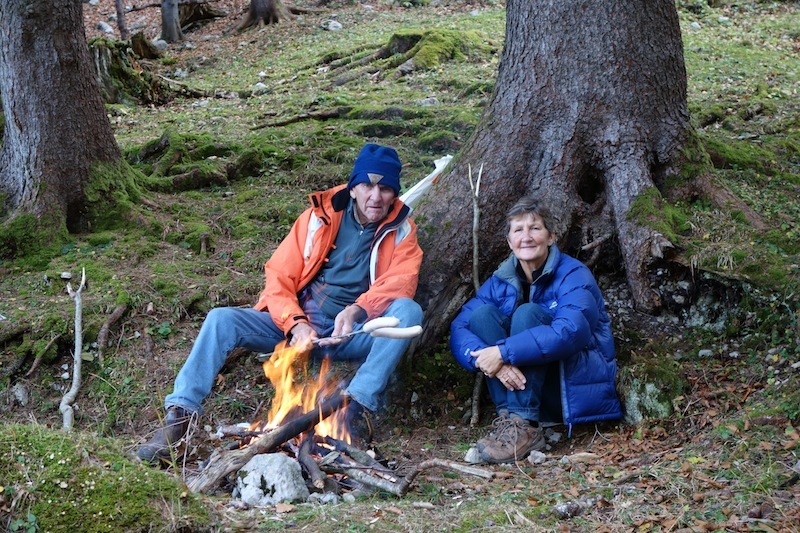 Thomas and his father Josef were travelling in the south of New Zealand, as we were, and we got to talking about wilderness areas generally. I suggested to them that if they wanted to see a compressed version of the NZ wilderness we should all do a walk in the Tasmania wilderness. They came and we took them on a ten-day walk into the Walls of Jerusalem. 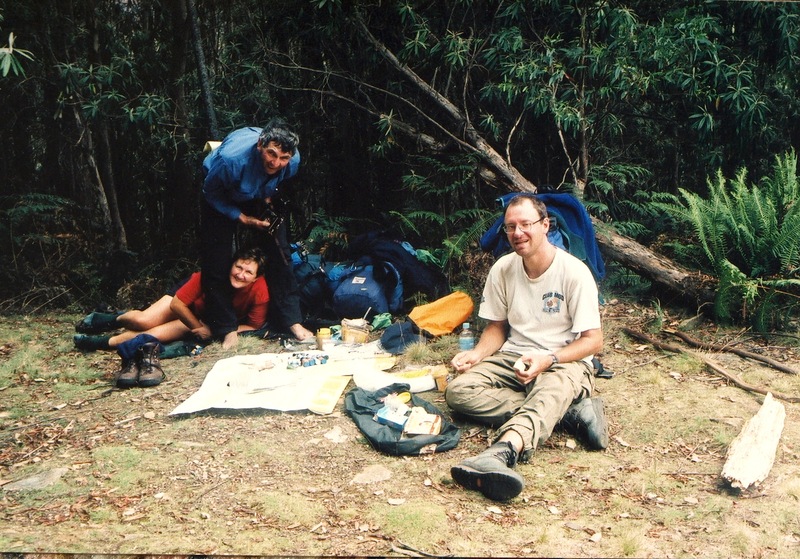 Josef, Bev and me at Lake Metson near the Walls of Jerusalem. 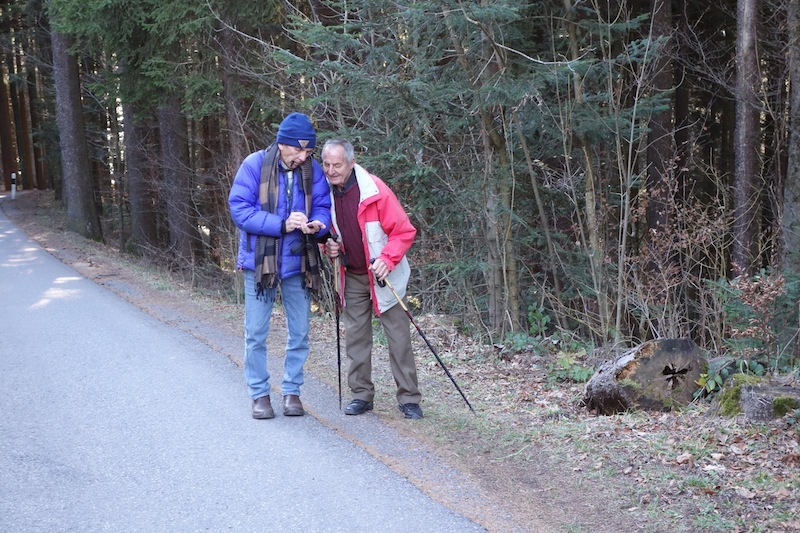 Bev and I studying the map and Thomas getting ready for another day’s walk. Like all walks in the Tasmanian wilderness it was outstanding. The days were warm and, surprisingly, there was little rain, which was just as well as the tent the boys were sleeping in was not all that waterproof. I think sleeping in a micro-sized tent was a new experience for them. Josef was in his element. He was interested in everything, particularly where tiger snakes that slithered into our camp at day’s end would sleep; he would follow them and hunt them out of our camp. Nothing is too much trouble for both Thomas and Josef and they are, like all our Swiss friends, generous in the extreme. After the Tasmanian trip Bev and I realised we had a lot in common with them and at our invitation they came to Australia again in 2009 and we took them to Groote Eylandt (see Leg 2 of this blog). The trip from our home to Groote took three weeks and we travelled through the outback to the Gulf country in the far north of Australia to Numbulwar, an Aboriginal community in East Arnhem Land from where we flew to Groote. So that is how we come to be visiting them in Rebstein, simply because they were fellow travellers who we met the road. Thomas and Josef with our mate Jamila on Groote Eylandt. Both Thomas and Josef are cabinet makers by profession. The following photographs show some examples of their work. Josef and Marcella’s house (the wooden one), one of the biggest pieces of woodwork Josef has done. 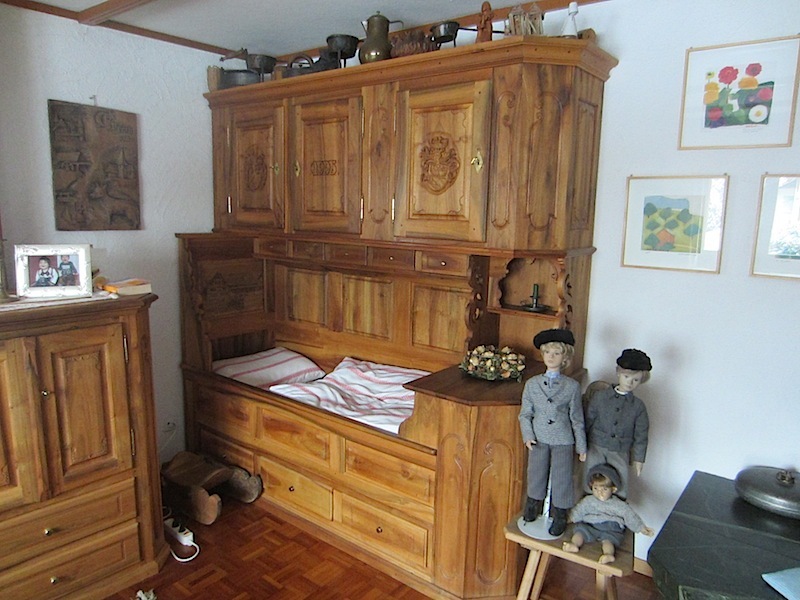 A cupboard bed, Appenzeller-style. This piece is made from solid walnut timber. 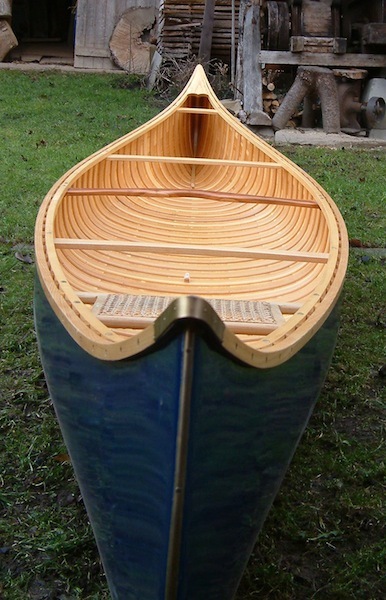 Canadian canoe built by Thomas. Thomas went to the USA to learn the art of canoe making. Our Rebstein friends not only love playing with wood but they also love chocolate, yoghurt, muesli, wine, homemade apple cider and traditional bush tucker such as forest berries. But I think their greatest love is walking. The day after we arrived they had us out walking. On a Sunday afternoon walk. Marcella (Josef’s wife), Thomas, Bev and Josef. The walk took us into this country. With country like this outside their back door it’s easy to understand why they love walking. Another thing the Swiss love doing is erecting crosses, churches, monuments and building restaurants on the top of mountains. 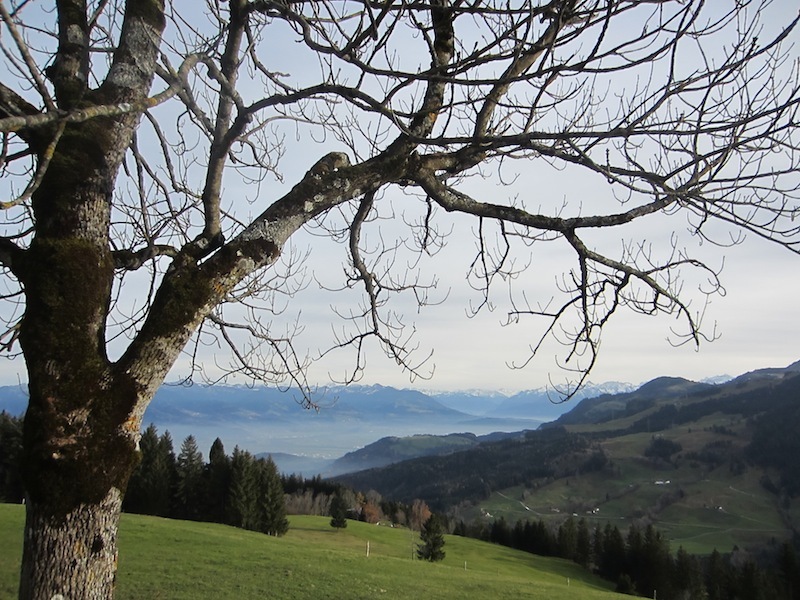 It seems to me the reward for getting to the top is to have coffee, beer or Appenzeller. 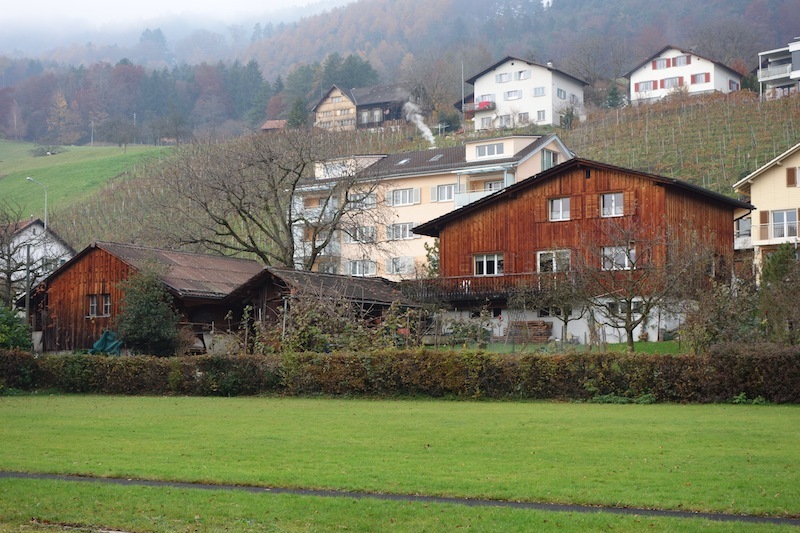 Appenzeller is a liqueur made from more than forty-two herbs and plants. 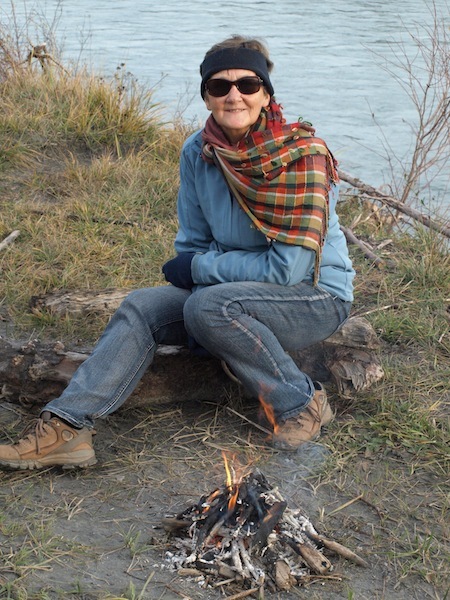 It is especially welcome at the end of a walk if the temperature is down around zero. It is also good for ‘gurgling’ (gargling) if you have a sore throat. 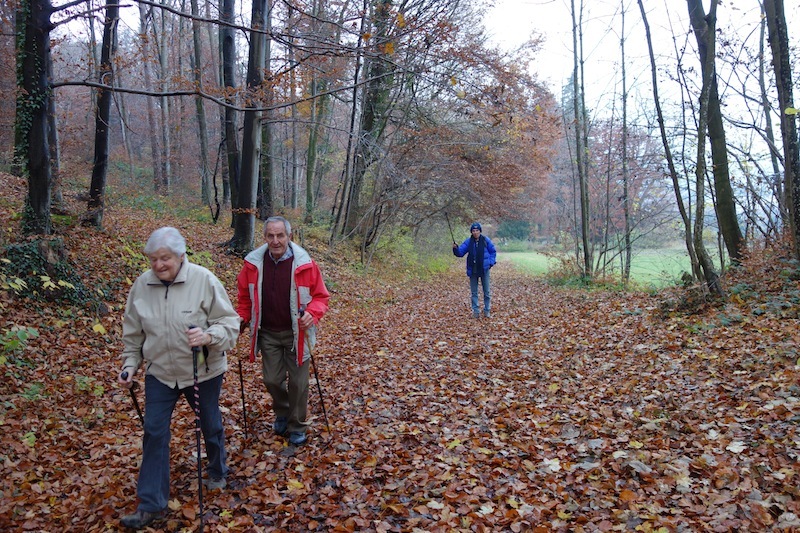 A good time to go walking is when fog envelops the low-lying towns and villages. Sometimes the fog hangs around for weeks, so it’s little wonder people want to get up above the fog and clouds to the sun. 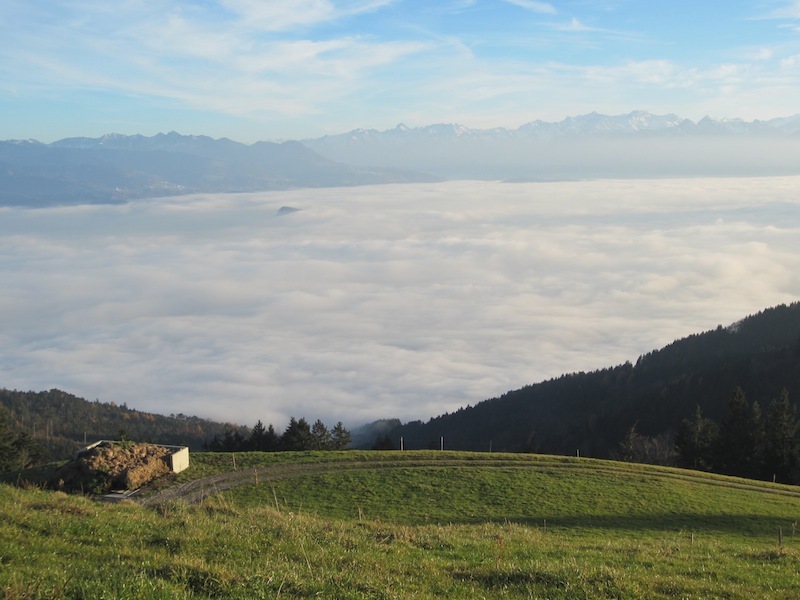 Fog over the Rhine River valley (Rheintal). 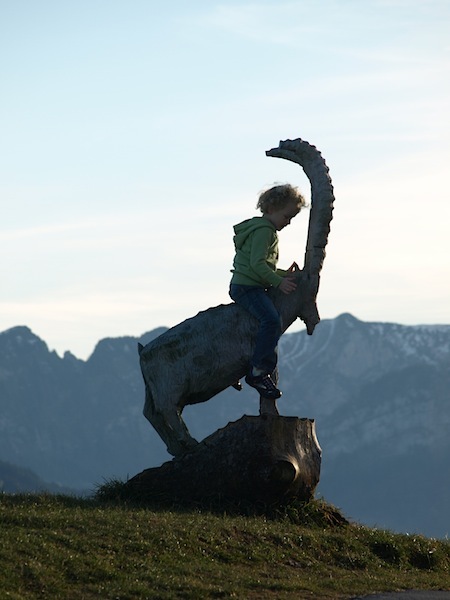 A little dude riding a wooden Steinbok. 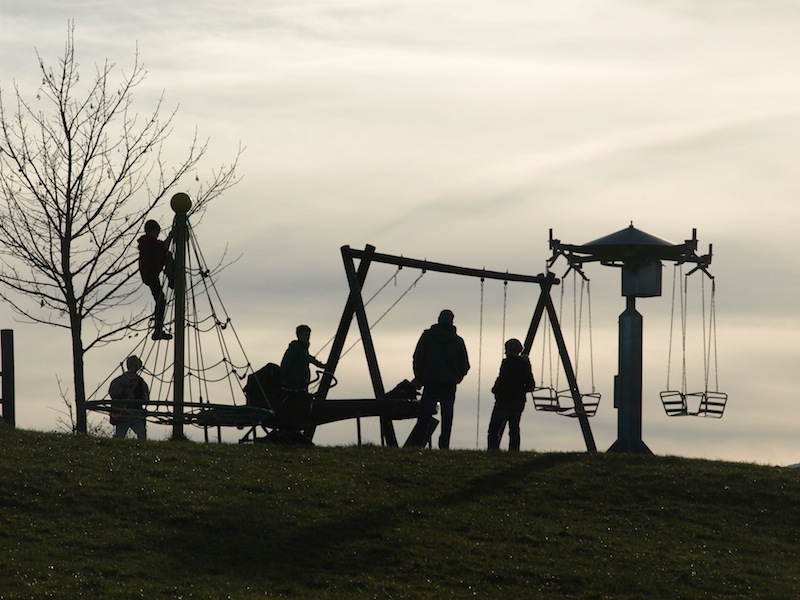 The first walk led us to a café and while adults and parents had coffee and cake (another Swiss love) kids played. 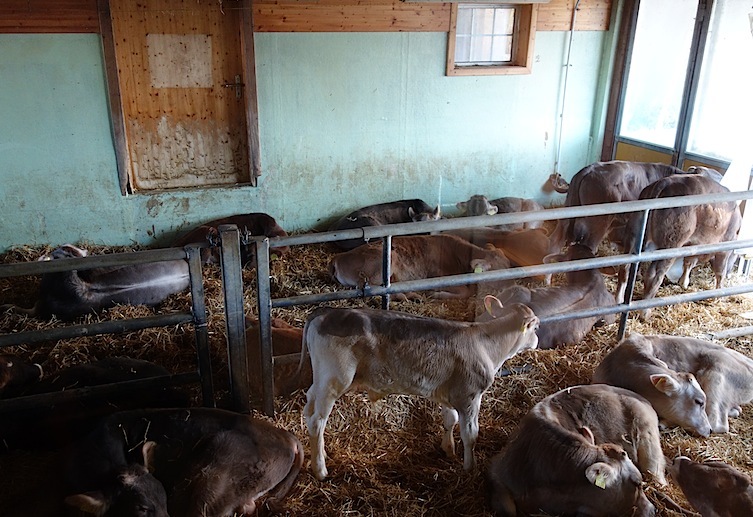 The entrance hallway leading into the café had one glass wall so children could see calves in their winter quarters. Steinboks are wild animals that live high in the mountains. The males are antagonistic towards each other, sometimes standing on their hind legs and coming down at each other with a clash of horns. Because Thomas works during the week Bev and I are left to our own devices when we stay. We either go walking, bike riding or when we have access to his car we take Josef and Marcella out for the day. Walking of course! Thomas works at a local window manufactory. Following are some photographs showing what Thomas does in the course of a day. First, imagine having to make the windows for this building using old fashion tools such as a tenon saw, chisel and mallet. It would take eons. 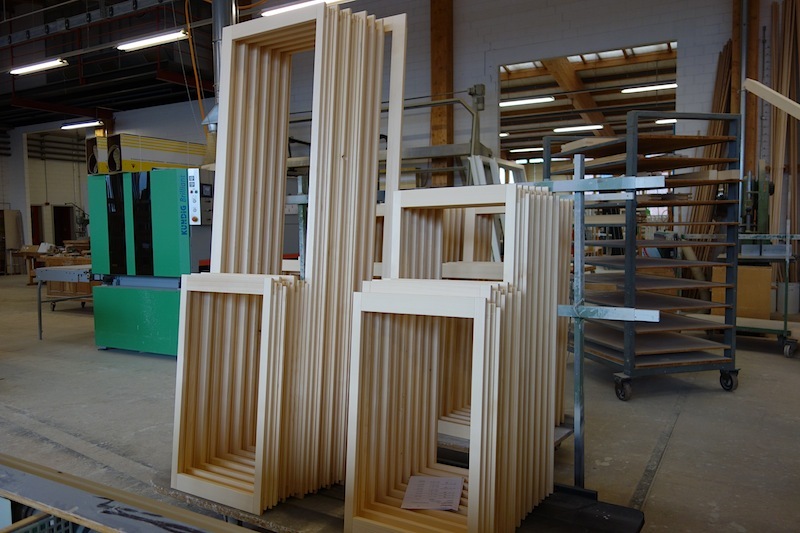 These days, with high technology and computerised machines, it is possible to make a window frame such as the ones in the following photo in just minutes! The frames ready for glazing. Mortise and tenon ends of frames. 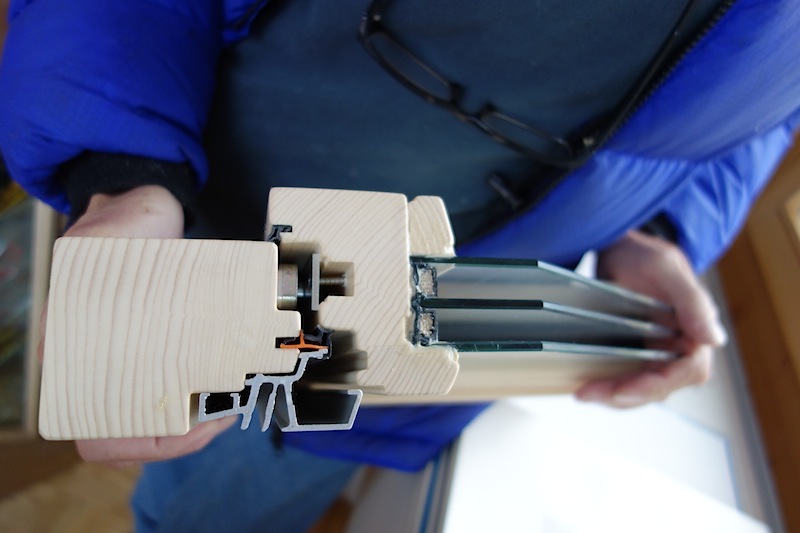 The windows are triple-glazed so they are extremely complicated in cross-sectional shape. The complicated moulding shapes of a window and frame. Note the three sheets of glass (not ordinary glass but safety glass) in the window frame. The gap between the glass sheets is filled with argon gas, which provides an almost neutral heat loss and cold penetration situation. There are also complicated rubber extrusion inserts to stop the cold wintry draughts getting through the joints. 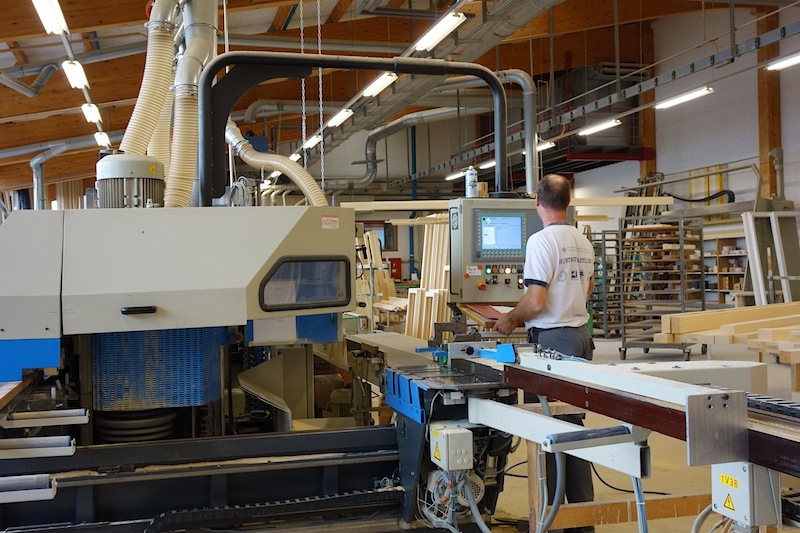 There are two machines that make the precision frames and windows. The one under Thomas’ command cuts the end joints and the second moulds (cuts) the longitudinal profile. Thomas with his end joint cutting machine. 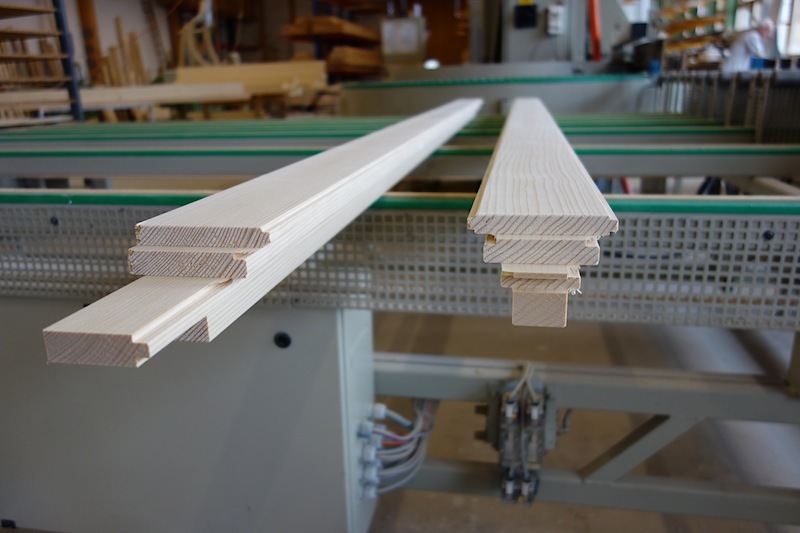 A blank length of timber is clamped on the sliding rack (right corner of photograph) and it slides from right to left past high-speed cutters which cut the mortise and tenon profiles. The profile cutters are behind the guard with handle. 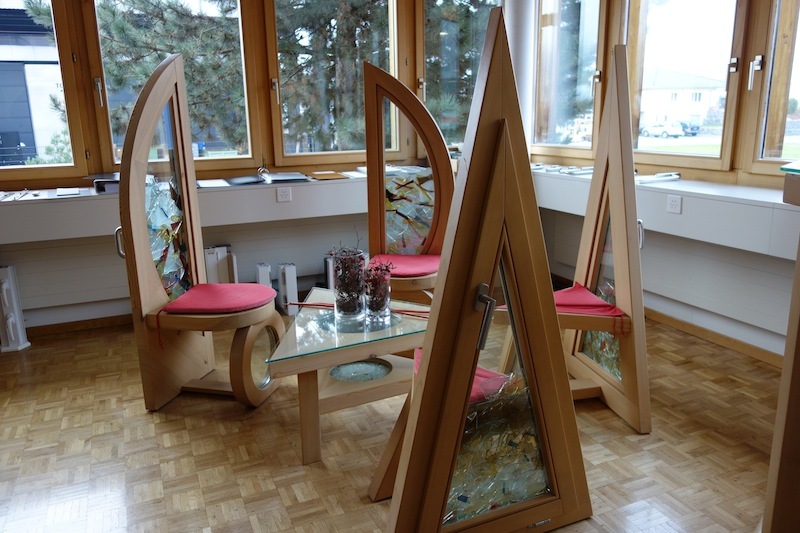 Examples (in the shape of chairs) of complex window frame joints. Anybody who plays with wood would appreciate the complexity of making such forms. Note the beautifully made windows in the background. When it comes to window design and construction in Australia we are still back in the dark ages. Aluminium windows (popular in Australia) are nowhere as warm and aesthetically pleasing as wooden ones. And as well, Swiss quality wooden sliding windows and doors never jump off the rails. Solid wooden windows in the raw. 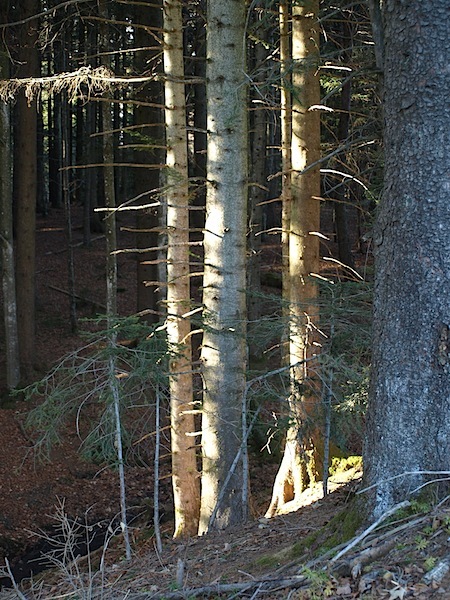 These pine trees are about thirty years old and they will be harvested in about another thirty years. Discussing the age of the forest trees. My communication sketch. Josef can point to the dates of when the trees were planted to when they are to be cut down. As I said, whilst Thomas works we are out exploring. 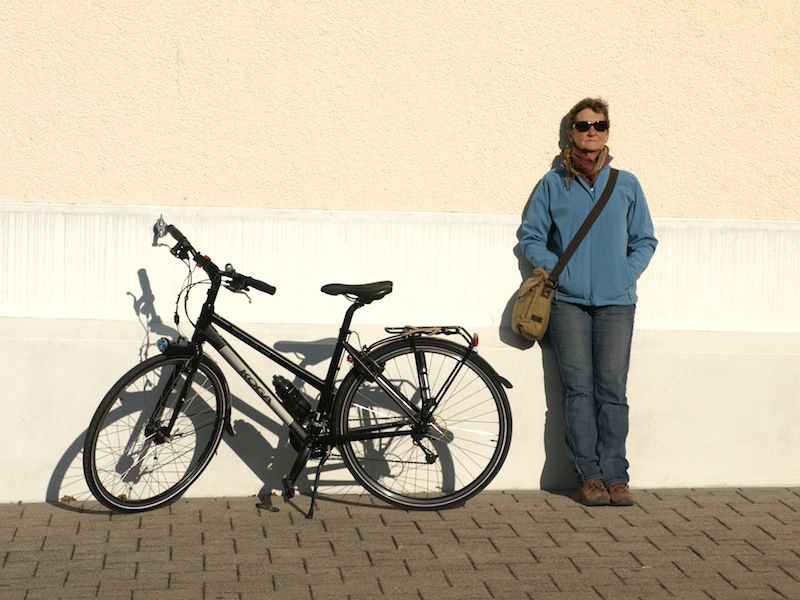 On a couple of days we went for bike rides along the Rhine River. Riding across the flood plain. The Rhine River near Rebstein is highly regulated. It is more a channel with subsidiary channels, such as this one running out from the main channel, to farms along the flats. 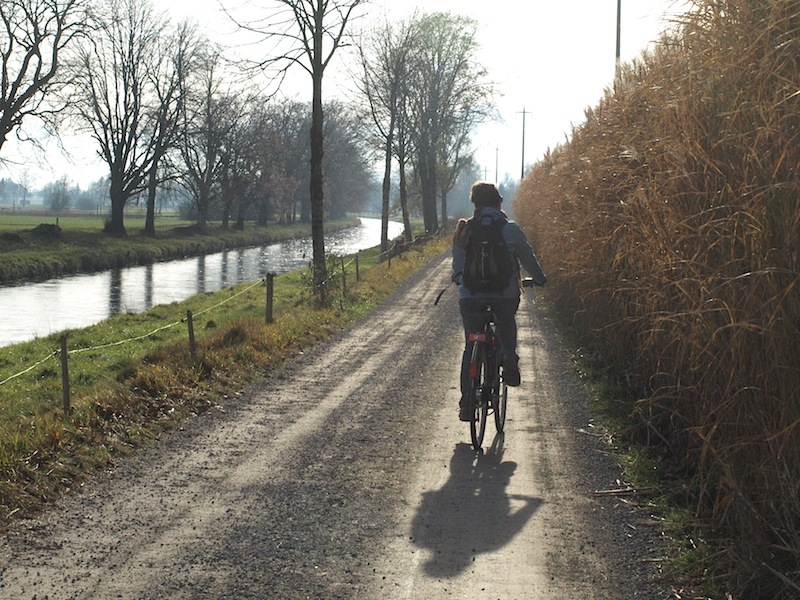 One disadvantage of riding a bike across the Rhine flood plain is the smell of muck. 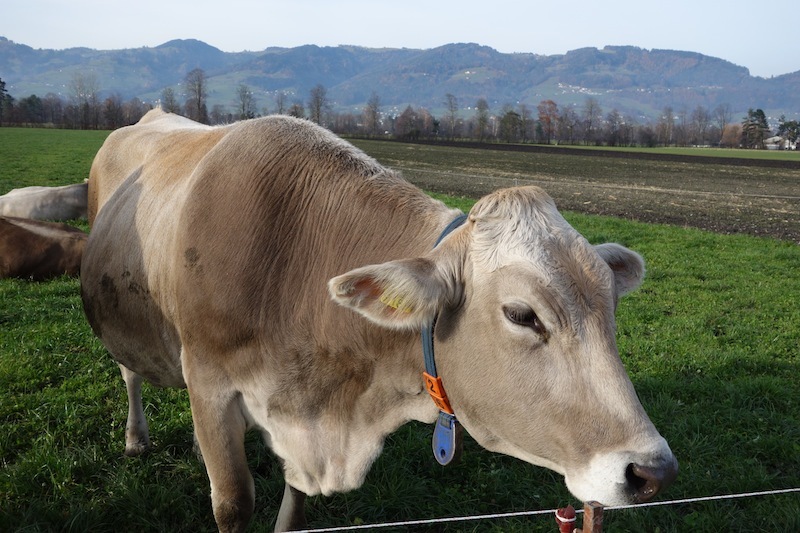 Muck is liquid cow manure, which farmers are constantly spraying on their fields. However the advantages of bike riding are you get a chance to meet some of the four-legged locals. Dreaming of her darling ‘love of thee’ or simply enjoying the sun? It is generally accepted in the goat / sheep identification world that it’s tails up for goats and tails down for sheep. 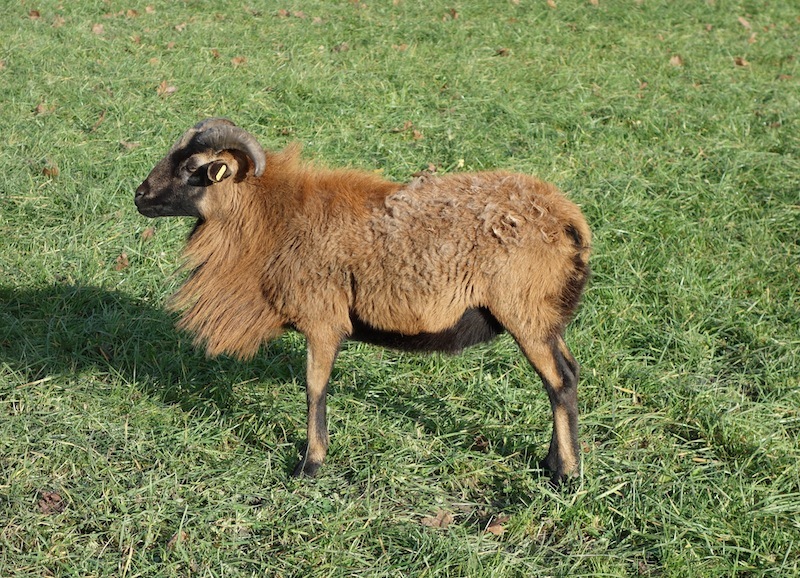 This specimen looks goat like at the front end and sheep like at the rear. I have read that goats and sheep can interbreed but the offspring do not live very long. A crossbreed is called a geep. The one here is not a geep, it’s a sheep, unless of course it’s a sick goat! A sick goat’s tail will hang down. T Bear on the lookout for another four legged local. T Bear was hoping he would meet one of his distant relatives on the Austrian border but unfortunately for him we didn’t see any. This bear is in a sanctuary in Bern. 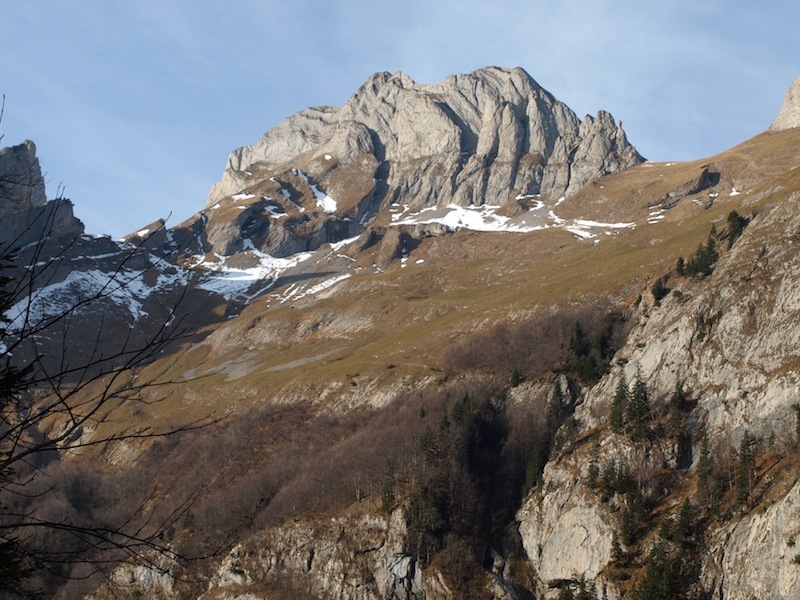 There are wild bears in the alpine regions of Europe. 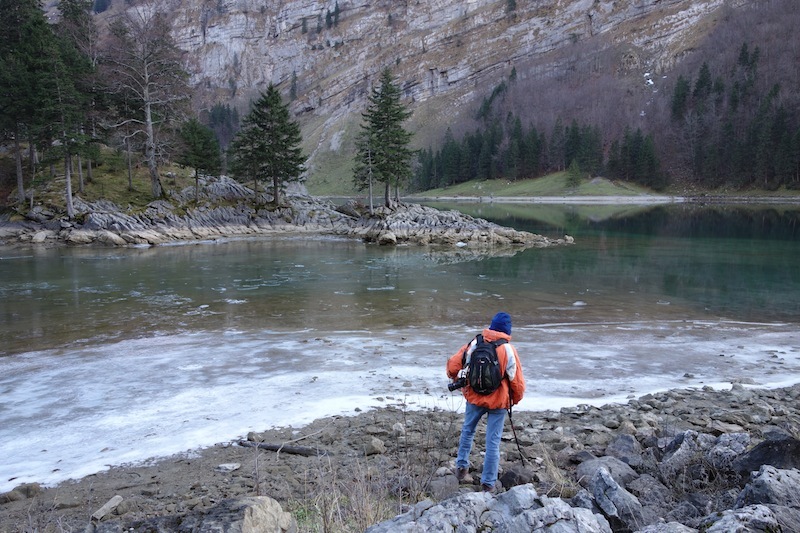 There was a sighting of a brown bear in Switzerland about two years ago. 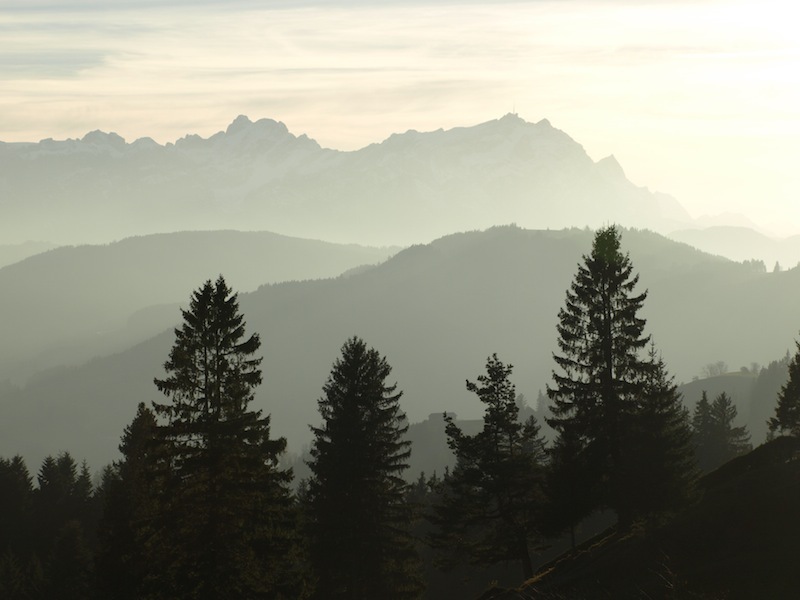 Several people reported seeing a bear near Zernez in a Swiss National Park in eastern Switzerland. A gamekeeper said the bear had most likely strolled in from nearby northern Italy. 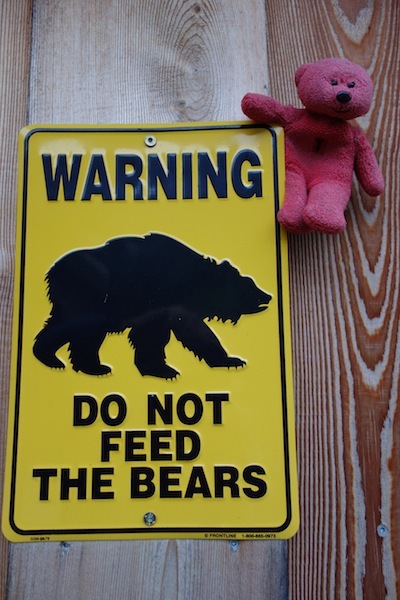 There is a plan to re-establish bears in some alpine areas. 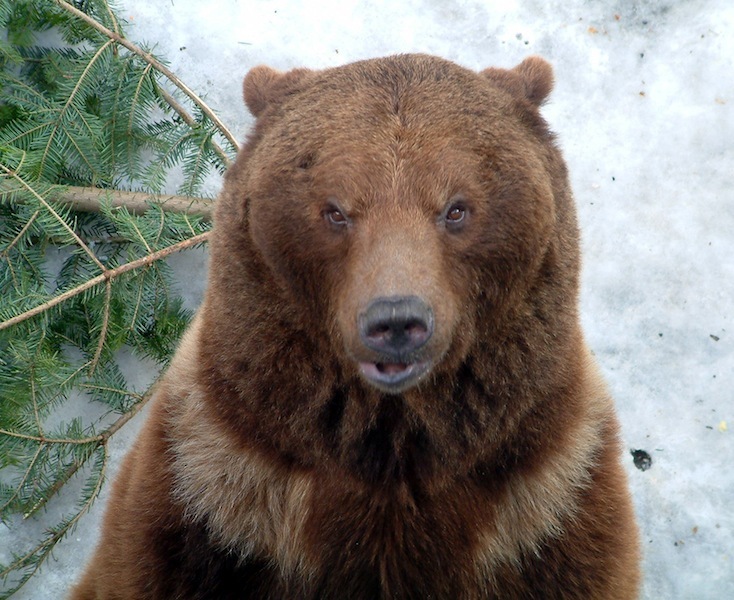 In Italy recently ten brown bears from Slovenia were released. 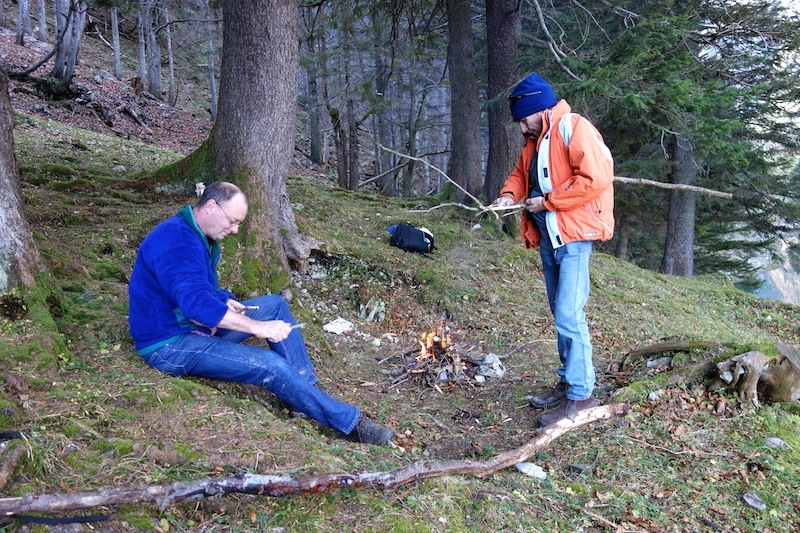 On one of our bike rides we decided to have a campfire. It was hard to get going due to damp wood and had we wanted to boil the billy it would have been impossible as Rhine river driftwood has very little combustibility. 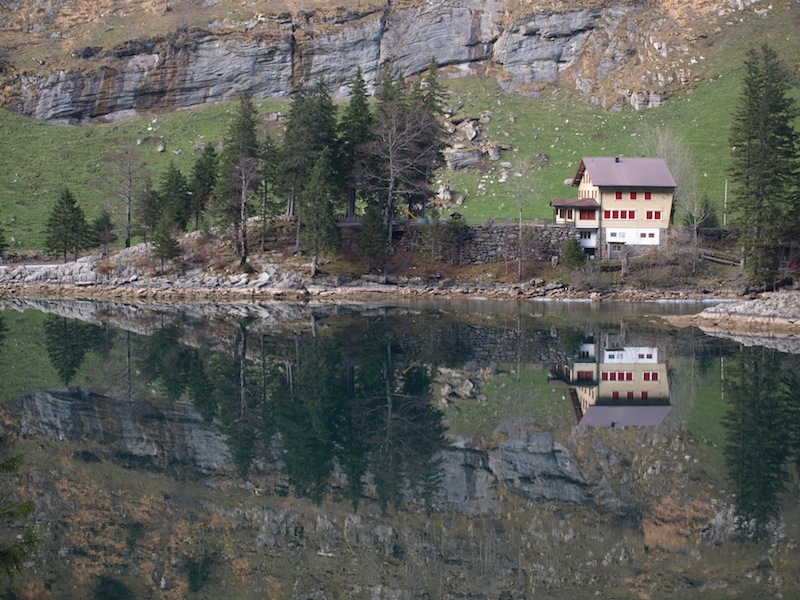 The Swiss side of the Rhine. 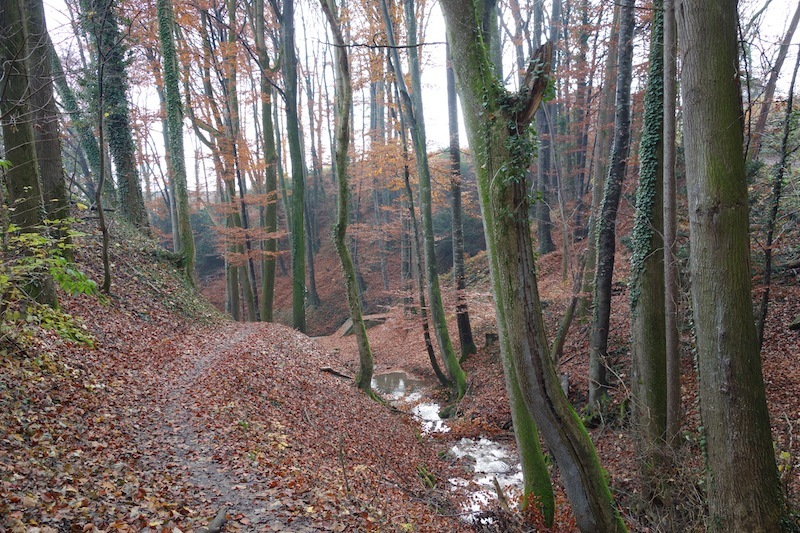 The Swiss Austrian border here follows the centre thread of the river. We eventually got the fire happening. Enjoying the sun on an icy day. Bike riding and walking puts you ‘out there’ and this means you see things. Following are a few of the things. An alternative to walking or riding a bike. 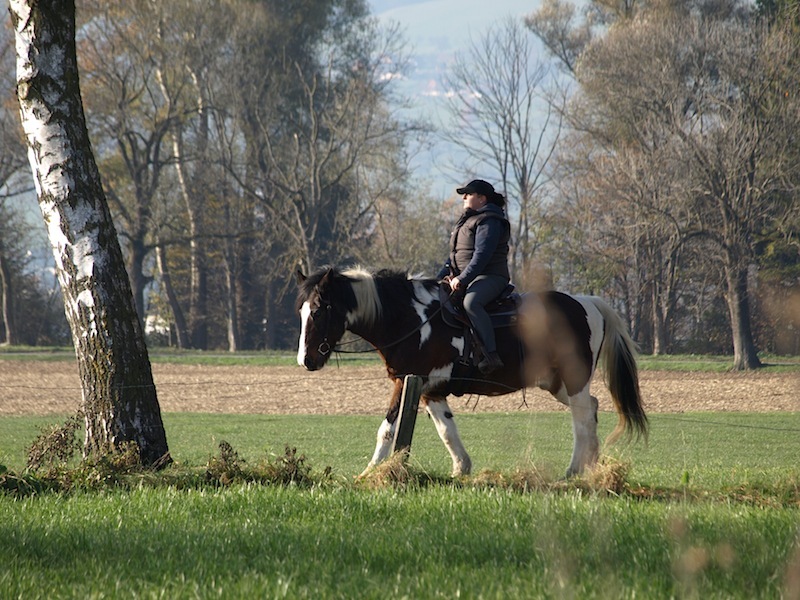 Owning a horse in Switzerland is a very expensive business because what arable land there is is better suited to profitable crops, not horse feed. 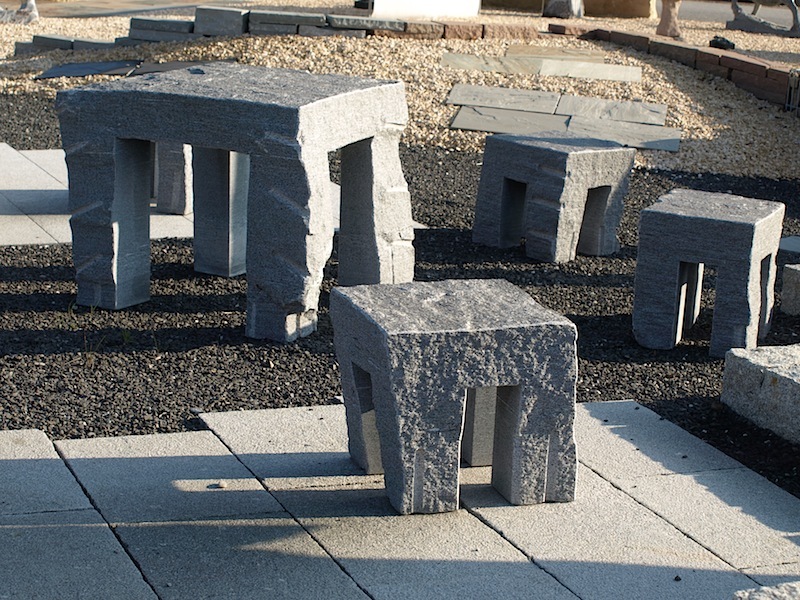 Outdoor granite furniture. I can only think a diamond-tipped chainsaw was used to fashion these pieces. Living garden sculpture. 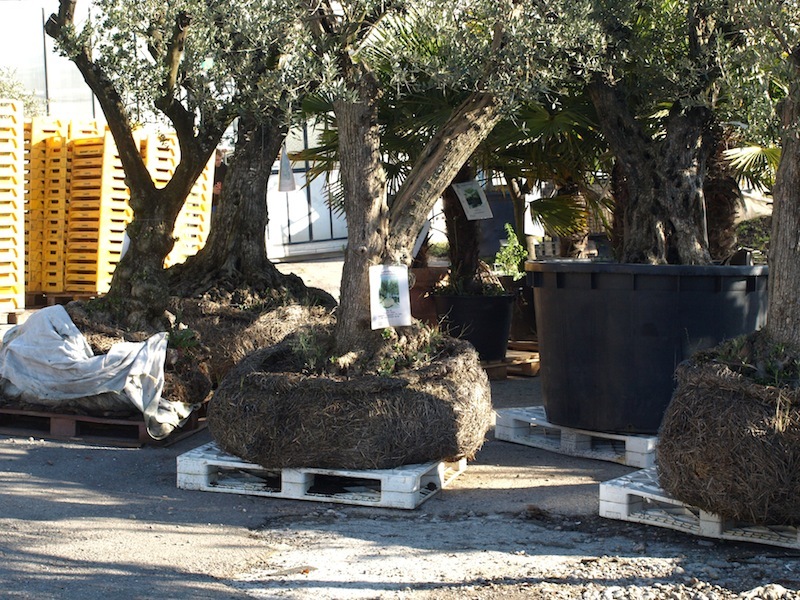 Mature olive trees ready for planting out. 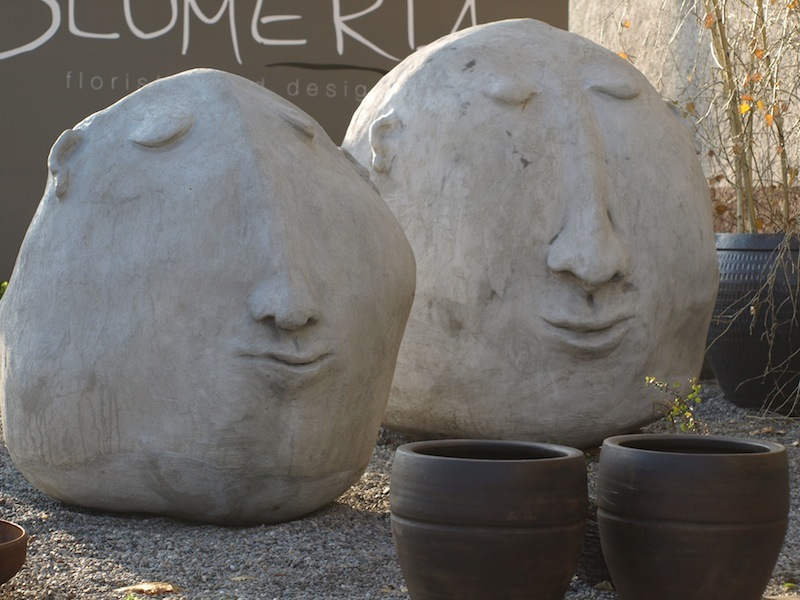 These little numbers cost around $2500 each, a pretty hefty investment for a few olives. The investment has to be completely wrapped up in winter. If it wasn’t snowing or raining Josef and Marcella would have us out walking. One such walk took us to this castle that looks down on their house. 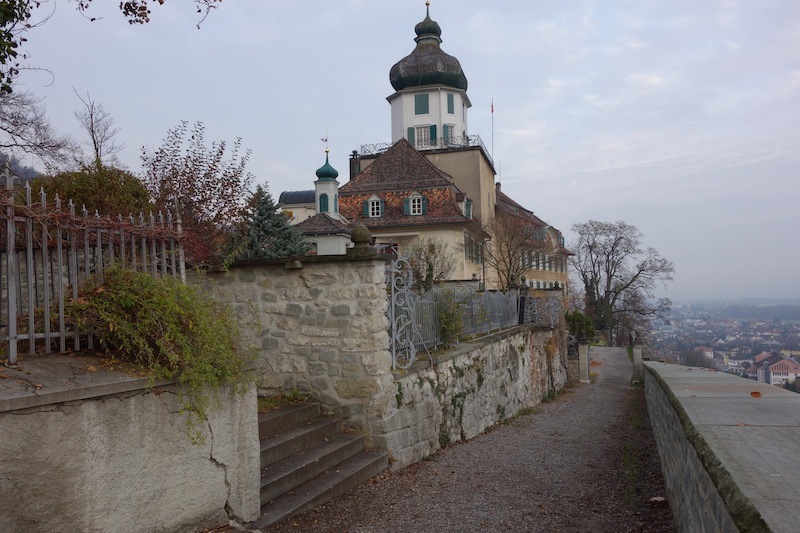 A castle in Switzerland doesn’t necessarily have parapets, moats and fortifications; it can simply be a big house. Grunenstein Castle, now converted to apartments. We could get used to walking everyday if it was through country like this. 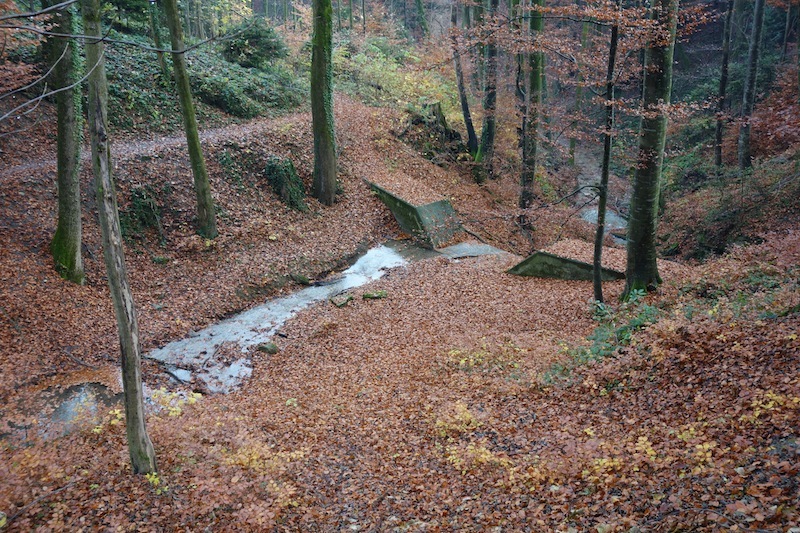 This little weir is used stop erosion rather than for holding water back. 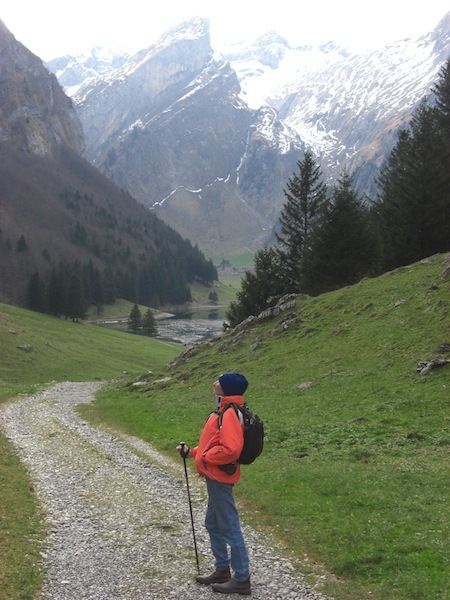 When weekends came around Thomas would take us into the mountains for some serious walking. 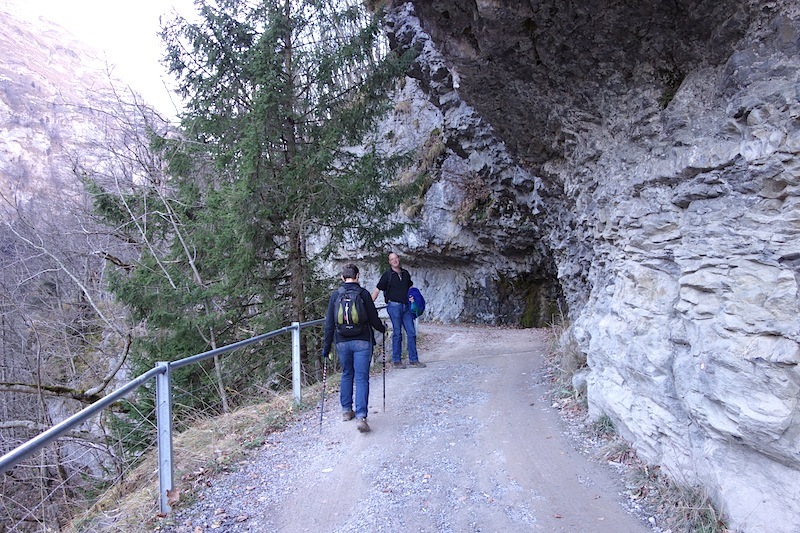 One thing you can be sure of in Switzerland is the beginning of any walk is going to be up hill. 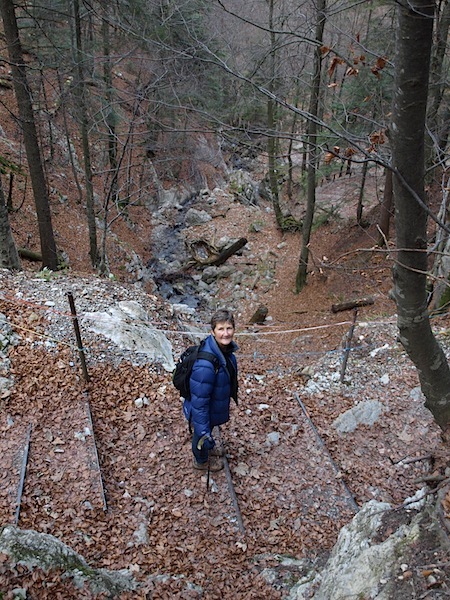 On this day all we knew was we were heading to one of Thomas’ favourite spots high up near the Santis mountain. When Thomas was a child he used to tend goats in this country. We were heading to a lake at the base of this mountain. 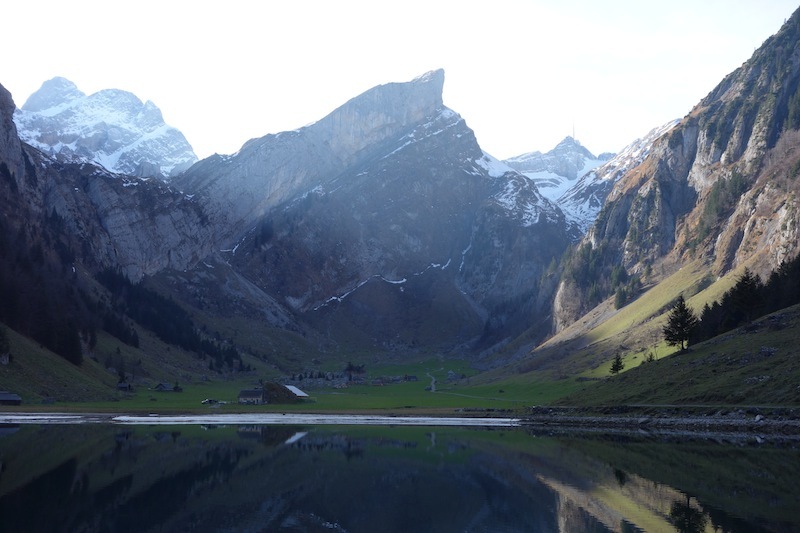 The amazing thing about the higher regions of the Alps is the mountains are naked. Having few trees means you can see the geology. 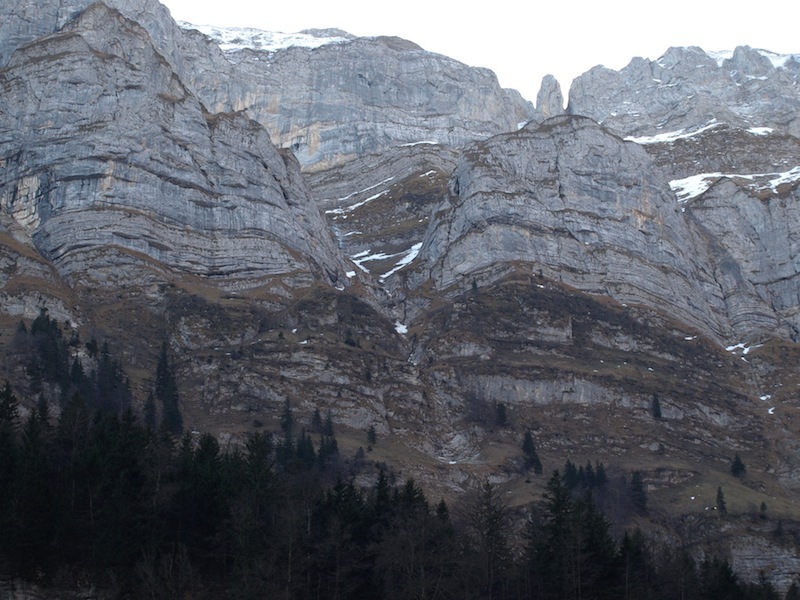 The mountain here was once lying horizontal (marine deposits) and it has been forced into the vertical. Imagine the forces to form this amazing contorted monolith. On the way up we were going to call at this restaurant for a cuppa but it was closed. Where is the restaurant you ask? 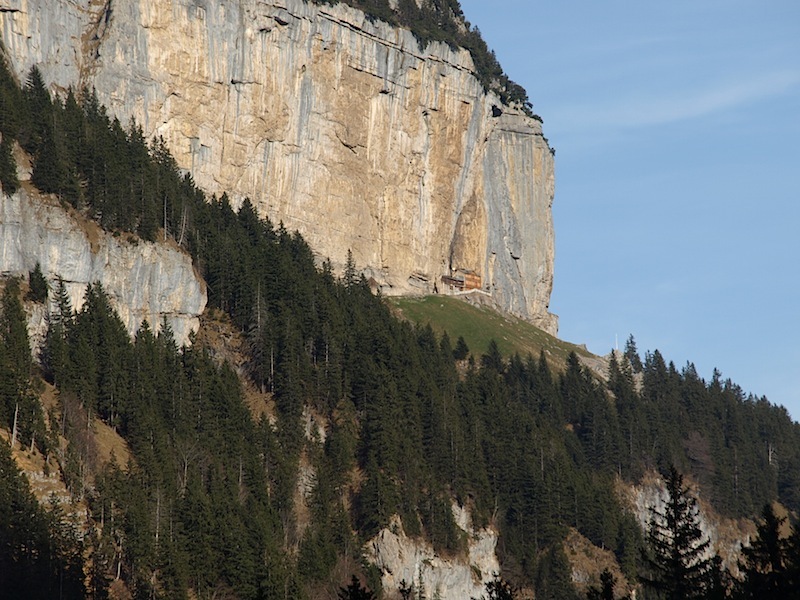 It is the building at the bottom of the rock face and at the top of the grassy patch. Another closed restaurant further up the track. The Santis is the pimple on the far horizon and is the highest point in the region we walked today. Picture book stuff. 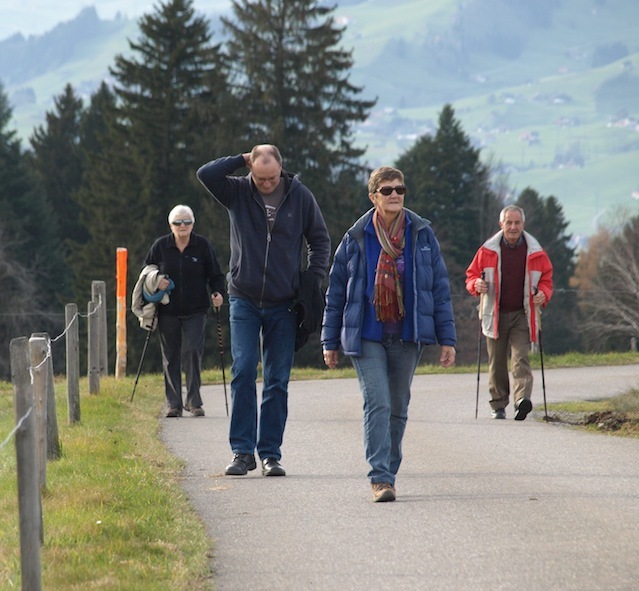 No wonder the Swiss want to walk all the time. 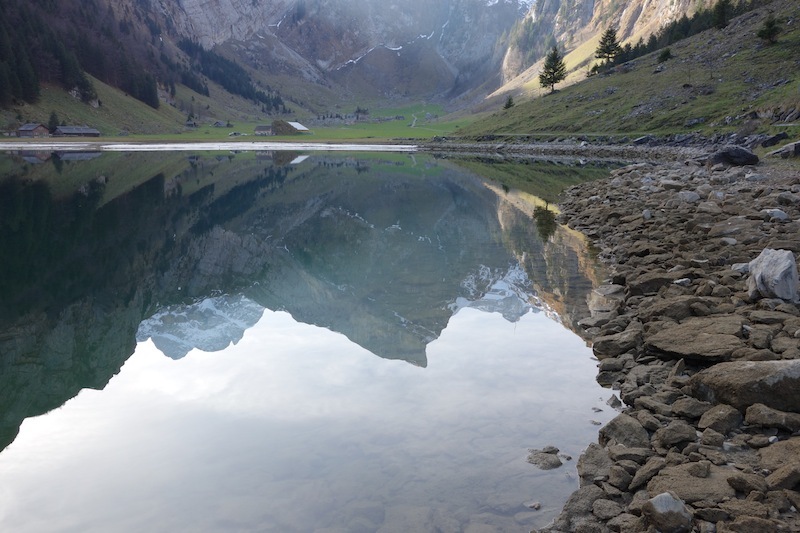 Seealpsee. Getting closer to our destination. This scene reminds me very much of places in the SW wilderness in Tasmania. 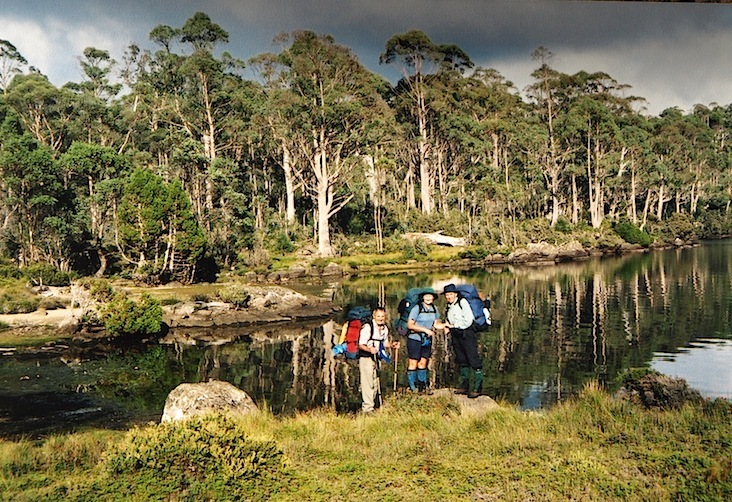 If you have never walked the wilderness in Tasmania it’s time you did. You will be pleasantly surprised that country like this exists in Australia. 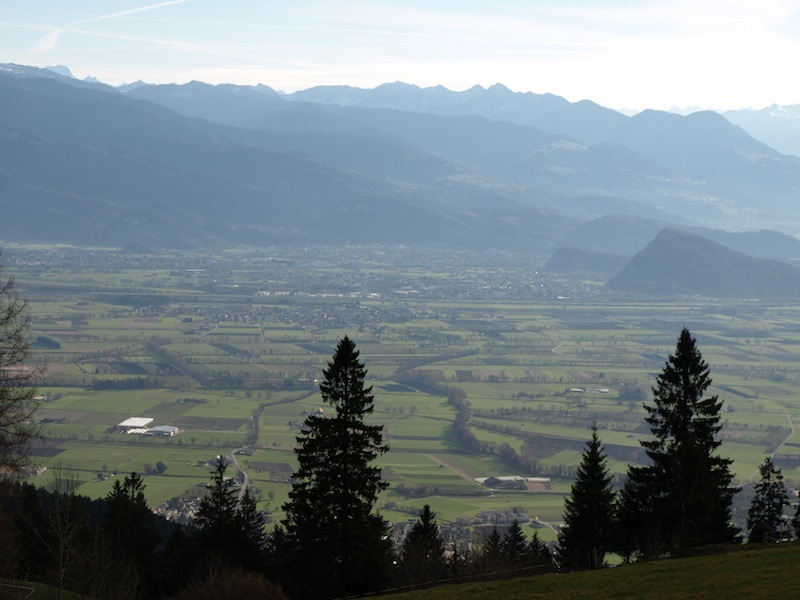 We went to the top of the Santis by gondola during one of our previous visits to Switzerland. On that day it was minus eleven degrees, only bearable because, of course, there is a restaurant up there to take shelter in. Our final destination was in the pine forest on the other side of the partly frozen lake. Making the forks for the sausages. The country above us as we walked down from the lake. There is a track just below the lowest snow deposit. It would be a great summer walk. Following are a few images that I feel are too good to leave out. Fred: I want to be up there Thomas. Thomas: Well, you will have to come back in summer. Forty one years on the road and we are still smiling. 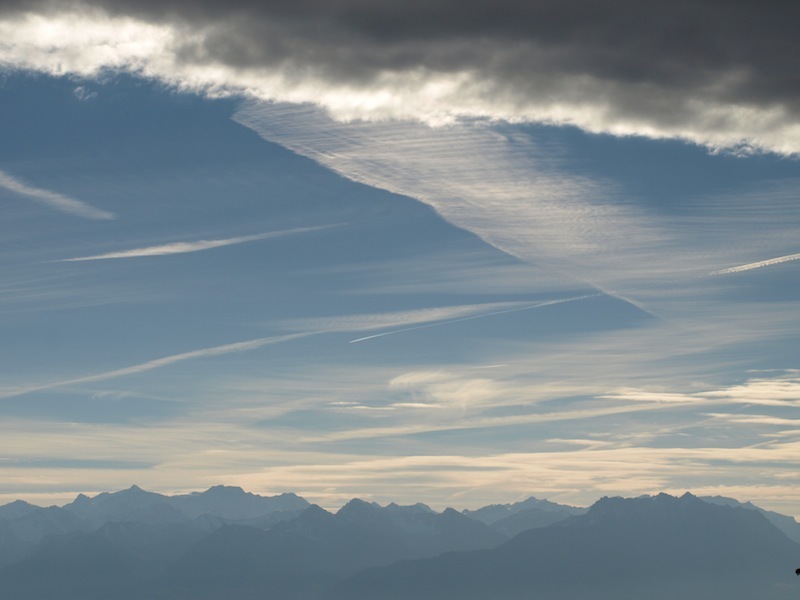 Even though Switzerland in many ways is a congested country the sky is wide and open. Before leaving Thomas and moving on to St Gallen to visit another friend, Thomas took us to Augsburg in Germany, famous for its Christmas market. That story is in the next posting.